Betting against U.S. government debt this year is turning out to be a fools errand. Just ask Wall Streets biggest bond dealers. While the losses that their economists predicted have yet to materialize, JPMorgan Chase & Co., Citigroup Inc. and the 20 other firms that trade with the Federal Reserve began wagering on a Treasuries selloff last month for the first time since 2011. The strategy was upended as Fed Chair Janet Yellen signaled she wasn’t in a rush to lift interest rates, two weeks after suggesting the opposite at the bank’s March 19 meeting. The surprising resilience of Treasuries has investors recalibrating forecasts for higher borrowing costs as lackluster job growth and emerging-market turmoil push yields toward 2014 lows. That’s also made the business of trading bonds, once more predictable for dealers when the Fed was buying trillions of dollars of debt to spur the economy, less profitable as new rules limit the risks they can take with their own money. Treasuries have confounded economists who predicted 10-year yields would approach 3.4 percent by year-end as a strengthening economy prompts the Fed to pare its unprecedented bond buying. After surging to a 29-month high of 3.05 percent at the start of the year, yields on the 10-year note have declined and were at 2.72 percent at 7:42 a.m. in New York. One reason yields have fallen is the U.S. labor market, which has yet to show consistent improvement. The world’s largest economy added fewer jobs on average in the first three months of the year than in the same period in the prior two years, data compiled by Bloomberg show. At the same time, a slowdown in China and tensions between Russia and Ukraine boosted demand for the safest assets. Wall Street firms known as primary dealers are getting caught short betting against Treasuries. They collectively amassed $5.2 billion of wagers in March that would profit if Treasuries fell, the first time they had net short positions on government debt since September 2011, data compiled by the Fed show. The practice is allowed under the Volcker Rule that limits the types of trades that banks can make with their own money. The wagers may include market-making, which is the business of using the firm’s capital to buy and sell securities with customers while profiting on the spread and movement in prices. While the bets initially paid off after Yellen said on March 19 that the Fed may lift its benchmark rate six months after it stops buying bonds, Treasuries have since rallied as her subsequent comments strengthened the view that policy makers will keep borrowing costs low to support growth. 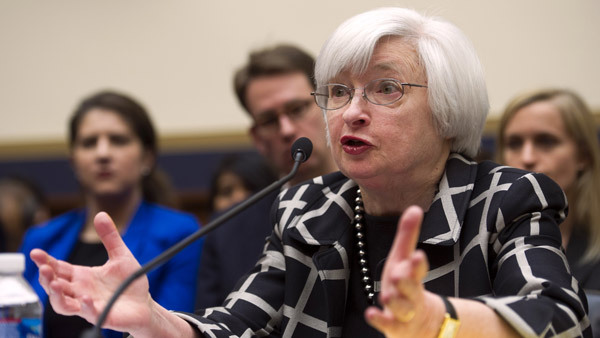 Then, in her first major speech on her policy framework as Fed chair on April 16, Yellen said it will take at least two years for the U.S. economy to meet the Fed’s goals, which determine how quickly the central bank raises rates. Economists and strategists around Wall Street are still anticipating that Treasuries will underperform as yields increase, data compiled by Bloomberg show. While they’ve ratcheted down their forecasts this year, they predict 10-year yields will increase to 3.36 percent by the end of December. That’s more than 0.6 percentage point higher than where yields are today. LaVorgna, who has the highest estimate among the 66 responses in a Bloomberg survey, said stronger economic data will likely cause investors to sell Treasuries as they anticipate a rate increase from the Fed. The U.S. economy will expand 2.7 percent this year from 1.9 percent in 2013, estimates compiled by Bloomberg show. Growth will accelerate 3 percent next year, which would be the fastest in a decade, based on those forecasts. Dealers used to rely on Treasuries to act as a hedge against their holdings of other types of debt, such as corporate bonds and mortgages. That changed after the credit crisis caused the failure of Lehman Brothers Holdings Inc. in 2008. They slashed corporate-debt inventories by 76 percent from the 2007 peak through last March as they sought to comply with higher capital requirements from the Basel Committee on Banking Supervision and stockpiled Treasuries instead. “Being a dealer has changed over the years, and not least because you also have new balance-sheet constraints that you didn’t have before,” Ira Jersey, an interest-rate strategist at primary dealer Credit Suisse Group AG, said in a telephone interview on April 14. While the Fed’s decision to inundate the U.S. economy with more than $3 trillion of cheap money since 2008 by buying Treasuries and mortgaged-backed bonds bolstered profits as all fixed-income assets rallied, yields are now so low that banks are struggling to make money trading government bonds. Yields on 10-year notes have remained below 3 percent since January, data compiled by Bloomberg show. In two decades before the credit crisis, average yields topped 6 percent. Average daily trading has also dropped to $551.3 billion in March from an average $570.2 billion in 2007, even as the outstanding amount of Treasuries has more than doubled since the financial crisis, according data from the Securities Industry and Financial Markets Association. The biggest dealers are seeing their earnings suffer. In the first quarter, five of the six biggest Wall Street firms reported declines in fixed-income trading revenue. JPMorgan, the biggest U.S. bond underwriter, had a 21 percent decrease from its fixed-income trading business, more than estimates from Moshe Orenbuch, an analyst at Credit Suisse, and Matt Burnell of Wells Fargo & Co.
Citigroup, whose bond-trading results marred the New York- based bank’s two prior quarterly earnings, reported a 18 percent decrease in revenue from that business. Credit Suisse, the second-largest Swiss bank, had a 25 percent drop as income from rates and emerging-markets businesses fell. Declines in debt- trading last year prompted the Zurich-based firm to cut more than 100 fixed-income jobs in London and New York. Chief Financial Officer David Mathers said in a Feb. 6 call that Credit Suisse has “reduced the capital in this business materially and we’re obviously increasing our electronic trading operations in this area.” Jamie Dimon, chief executive officer at JPMorgan, also emphasized the decreased role of humans in the rates-trading business on an April 11 call as the New York-based bank seeks to cut costs. About 49 percent of U.S. government-debt trading was executed electronically last year, from 31 percent in 2012, a Greenwich Associates survey of institutional money managers showed. That may ultimately lead banks to combine their rates businesses or scale back their roles as primary dealers as firms get squeezed, said Krishna Memani, the New York-based chief investment officer of OppenheimerFunds Inc., which oversees $79.1 billion in fixed-income assets.